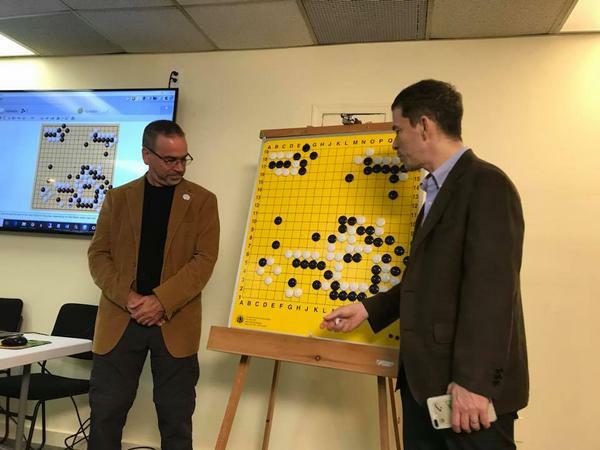 The National Go Center in Washington, DC was very fortunate to have a teaching visit in September from Mr Michael Redmond 9P of the Nihon Ki-In. The visit was sponsored by the Nihon Ki-In and the Iwamoto North America Foundation with numerous exciting events for the go community in DC and surrounding areas. 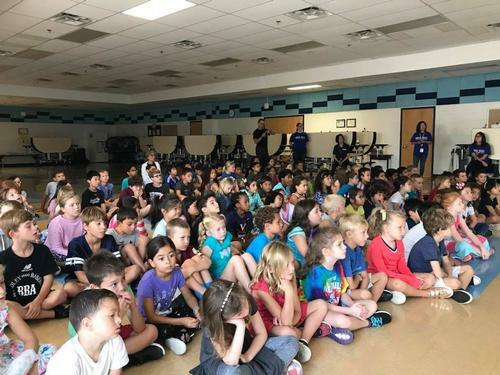 Michael Redmond did not get much chance to recover from jet lag before addressing two Japanese language immersion schools in Fairfax, Virginia. The school lectures were graciously arranged by Ilryong Moon, a member of the Board of the Fairfax County Public Schools. Mr Moon grew up playing baduk in his childhood in Korea. He is a strong supporter of go in schools recognizing its educational value. The first school visited on Friday morning was Great Falls Elementary in Great Falls, Virginia. Students from grades 1-6 enrolled in the Japanese language program assembled to hear a lecture on the origins of go, its cultural history and significance, and the values that go playing promotes.The story of General Guan Yu so intently concentrating on his go game that he does not feel the pain of an operation on his arm was a big hit with the children! Our group with Michael Redmond arrived a little early at the next school, Fox Mill Elementary in Herndon, Virginia. There was still a dance exercise class going on in the gym where the lecture was to be held. Michael Redmond, Chris Garlock the Managing Editor of the AGA E-Journal, and Ilryong Moon got a chance to limber up and show off their dance moves before the next group of Japanese immersion students arrived. Gurujeet Khalsa, the Executive Director of the National Go Center, introduced Michael Redmond after receiving a hearty konnichiwa from the students. Events continued that evening with a lecture at the National Go Center. With added commentary from Chris Garlock and questions from the audience, Michael Redmond analyzed Game 23 in the AlphaGo vs AlphaGo series. It was fascinating for the audience to see how AI has deepened our understanding of the game and to consider the challenge of how and when to play AI inspired moves in their own games. The lecture was filmed and will be made publicly available after editing. An exciting part of the Michael Redmond 9P visit was the inauguration of a new broadcast room at the National Go Center. In the week before his arrival preparations for a dedicated broadcast room reached a fever pitch. After live Twitch broadcasts at the recent US Go Congress attracted audiences of over 12,000, E-Journal broadcast team members Nathan Epstein, Joel Cahalan and Jeff Fitzgerald – who worked with director Stephen Hu — enlisted the E-Journal and the National Go Center to see if a year-round home could be found for the E-Journal’s broadcasting efforts. “We really upped our broadcasting capabilities at the Congress,” Epstein said. “Having a dedicated space will allow us to continue to develop that outreach capability.” Khalsa added that “The National Go Center is excited to support this outreach by the E-Journal and the AGA,” with the donated space at the Center. Michael Redmond and Chris Garlock initiated the new broadcast room filming a lecture in their ongoing AlphaGo collaboration. Use of the new broadcast room kicked into high gear on Saturday with the DC Fall Open, a 4-round tournament at the National Go Center. Michael Redmond and Chris Garlock live streamed commentary of the top board in each round while Nathan Epstein managed cameras, audio, and lighting. The live stream went out over the National Go Center’s Twitch channel and can be viewed here. 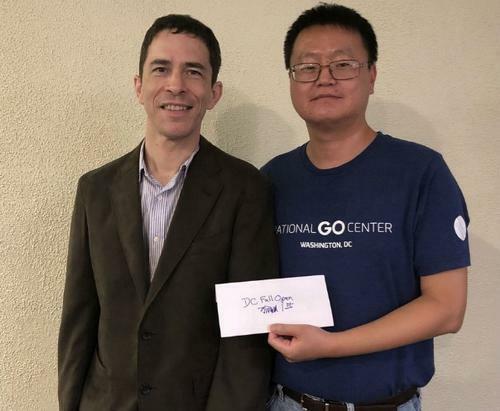 The tournament was won by Yuan Zhou 7D, a popular go teacher and author in the DC area. Participants in the tournament were encouraged to save their game records and send them in for Michael Redmond to analyze. Sunday morning there was a bagel brunch served at the National Go Center accompanied by game reviews with Michael Redmond. Good food, lots of questions, and great commentary made for a pleasant morning event. Mr Redmond had a chance to learn a little himself that night relaxing at Chris Garlock’s house. Well known as a master of cooking the Spanish dish paella, Chris taught Michael some of the secrets of a successful paella dish. The final event of Michael Redmond’s visit was Monday night at the NoVA Go Club in Arlington, Virginia. The club has a long history in the DC area. It merged overall operations with the National Go Center and continues to meet weekly. Michael Redmond played a six-person simul at the club. It was a great visit – everyone was excited to learn from Mr Redmond and bid him a fond farewell! – by Gurujeet Khalsa – Photography by Ilryong Moon, Chris Garlock, and Gurujeet Khalsa.